Who’s Coming Up on Monday March 5? E Kanikapila Kakou is proudly celebrating 35 years of bringing the best Hawaiian music to our audience on Kaua’i and our 35-year lineup of over 300 musicians is very impressive, but it all started like a little backyard jam where everyone sat around and sang the songs, laughed at the stories, and absorbed Hawaiian culture served on a ti-leaf plate. It was simple but something that grew on you . . . like going to a party every week. This week we turned the clock back to the early days and had ourselves some really good fun, starting with a lesson in ‘Olelo Pa’i’ai or Hawaiian Pidgin English. Three of our four Titas showed up – Aunty Kay Den (Hob Osterlund, Aunty Choppah (Maka’ala Ka’aumoana) and Auntie Coo (Sabra Kauka); Auntie Tita (Sandy Swift) was unfortunately under the weather. Their collective mission was to help our non-Pidgin-speaking audience get acquainted with the basics of our local Creole language. More people speak Hawaiian Pidgin than any other Creole language. Pidgin is not slang. In 2013 it was declared one of the official languages of Hawai’i. How did this group start? Nurse Hob Osterlund, who initiated and directed the Pain Management Clinic at Queen’s Hospital in downtown Honolulu until her retirement, started a Pidgin class at Queen’s in order to help the new nurses from all over the country and other countries to understand the needs of their patients, many who spoke only in Pidgin. It also helped in the communication among everyone dealing with the important task of providing medical care. Obviously, some nurses weeded themselves out of the local work force because they will never use the word “doo-doo”. Because the local Pidgin English is a potpourri of idioms and alterations from every ethnic group that came to work in the plantations mixed with some “butchered” Hawaiian words for the sheer necessity of trying to understand each other, a new language evolved. Highly colloquial, depending on which community of which island you are from, the need to understand each other is a survival mechanism in Hawai’i. Some outsiders hear it as condescending or making fun of each other, but that is not the intent of Pidgin. It’s inclusive rather than exclusive; it’s akin to improv comedy where each speaker builds on what the other said. The Kam School and Punahou grads were not allowed to speak Hawaiian or Pidgin in school; they could speak only English, Latin, French and Spanish. The public school grad actually attended an English Standard high school. One of the spin-offs from these experiences was the attempt of three “experts” to give a class in Pidgin which was more hilarious than educational. They added a fourth Tita, Sabra Kauka, to give legitimacy and credibility to their group. They covered the commonly used idioms such as “Da Kine” (universal word used for everything); “What? Baddah You…?” (am I bothering you? ), “Fo’ real?” (Is that true? ); “Po’ t’ing” (you poor thing). They explained special words such as “Bolohead”, i.e. “The buggah stay ‘a’mos’ all bolohead aw’ready!” (He’s almost bald; or I cut the hedge too short). Tag-on phrases to elucidate intent, such as…. Hard to explain these but used in context, you can catch on . . . easy peazy; it adds a poetic lilt to the phrase. A word that precedes any other verb such as . . .
Doesn’t mean you are trying at all, but jus’ try understand how it’s used. The difference between “Bla-lah” and “Brud-dah” was a debate that could go on and on; you can mean “tough tita” or “sweet tita” just by the way you pronounce “Ti-ta”. There are many nuances in this language, but you need to pay attention to how it’s pronounced, how it’s used in context, and even who you are talking to or who’s speaking to you. Hob also worked at Wilcox hospital where many of the nurses and staff were of Filipino ethnicity. At the end of each day, the housekeeper would enter her office and ask her, “Pinis’?” She would reply, “No, thank you.” She knew he was asking her if she was finished for the day. While, at times confusing until understood, these “substitutions” are often hilarious. Although they came together as the group Hoku Pa’a just about eight months ago at the Mango Festival in Waipa, they have collectively accrued over a hundred years of musical experience. They are used to playing in bars over the sound of the blenders and at family lu’au where someone always says unexcitedly, “Oh … them again? 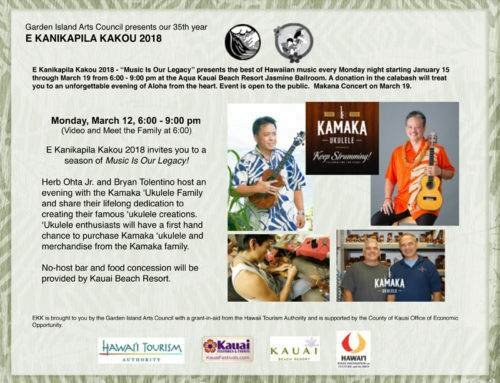 !” But for the Kaua’i audience, this very funny backyard jam party-loving trio who laughed a lot, joked a lot, and liked to play with the audience was just what we ordered. Bring it on! As appropriate, they began with a Kaua’i song “even if Ku’uipo sang it last week . . . she stole all our songs!” Aloha Chant was a great way to start with their robust singing style, definitely well-trained by their years of singing at parties and bars; Vern Kauanui went up and danced with his ipu heke. Tani and Darlene tagged-team the verses in a second Kaua’i song, Nani Wai’ale’ale. Lady Ipo went up to dance the hula. 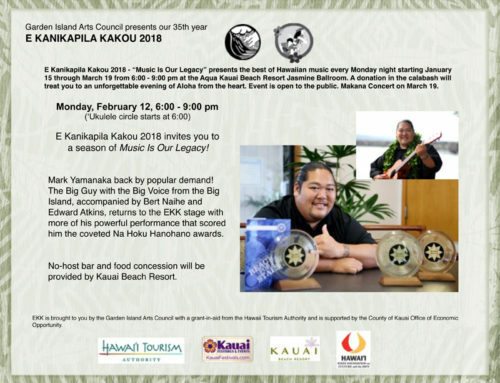 Ipo is a familiar face onMoku-O-Keawe because she flies every chance she gets to visit her grandchildren, children of her extraordinary daughter, composer/singer Kainani Kahaunaele. Back to singing, Darlene sang an old style Hawaiian mele titled Ke Aloha No O Honolulu which she learned at age 18 from Uncle George Na’ope for the steamship Honolulu which stopped at ports between west Hawai’i and Honolulu. Perfect song for her beautiful voice. Duane is not a silent bass partner. He sang Ke Ala A Ka Jeep by Eddie Kamae and Auntie Mary Kawena Pukui. 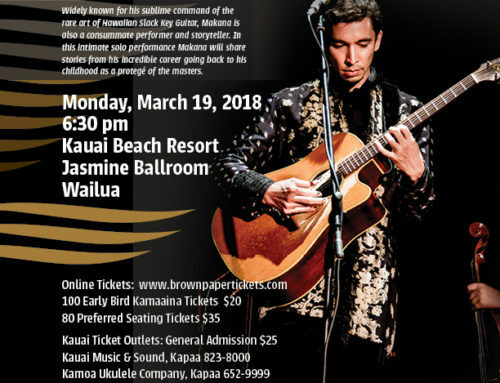 The audience was getting in the act with shouts of “Yeehaw!” and “TSA!” “When we record our CD, we will add a jazzercise track by Duane singing this feisty song.” Boosted by the cheers, Duane sang about his three girlfriends – tuberose, ilima and pikake – with another sassy Wai O Ke Aniani. Ka Huila Wai by Tani honors the building of the first water wheel used to generate power for the sugar plantation in Ka’u; huila means wheel and waimeans water. I think she threw in some lines from the song rollin’, rollin’, rollin’. She spoke the words of the Carburetor Song that talks about loving someone even if their “parts” were falling apart like an old car. This song is from a Jewish genre of music called klezmermusik. Go figure. So much in the groove, Tani launched into a fast-paced song about the westside of the island called A Kona Hema. Originally written as a chant in honor of chief Ehunuikaimalino and later put to music, the song takes us along ports that Kalakaua might have visited on his frequent trips to the island. There was no stopping her as the fun-loving Tani went to town withBlue Darling, a country western that commonly closes down the evening at backyard parties. This trio has had a lot of practice at this. According to Tani, every 15th and 30th of the month, they have to perform at parties . . . they are “pay day” parties. Reminds me about the Kupaoa party song . . . way to go! These songs had such great beats that the entire back row of volunteers got up and started to boogie … and this continued the whole night. The trio had found their groove as they saw the happy dancers hopping all over at the back of the ballroom. It should be noted here that at least two of the dancers had just had hip surgery. You could never tell by the way they were bopping around. Tani continued in her extraordinary crystal clear voice singing Aloha Punalu’u by George Kealoha Iopa which speaks of the beautiful beach area in Ka’u known as Punalu’u. One of the most beautiful songs in their repertoire, she has incredible harmony and pacing. She shared stories about her grandfather who was born in 1900 in Kapa’ahu in the Puna district. The area is now covered by lava but at one time the Waha’ula (Red Mouth) heiau was still in use and the Queen’s Bath is still there. He described the beautiful volcano waterfall that flowed over the cliffs of Holei. They did activities you can do only on Hawai’i island such as cooking on the lava flow and shoveling out the hot lava and dropping a quarter in the hole to watch it melt. Tani’s grandmother was born in Waimea on Kaua’i but moved to Ka’u on the south side of the island where she was hanai’ed as an only child with her new family. Someone shouted Kalapana (Holei). Their voices blended together in the most exquisite harmony. Their pacing was beautiful and you could just taste the deliciousness of the melody when they sang. Darlene spoke about the late Don Ho and the beautiful songs he sang and recorded by master composer Kui Lee who left an incredible body of work when he passed away much too early. Tani shared that he’s probably the only composer who used words like “Trousseau” and “Aurora Borealis” in his songs. Tani was by this time so cut loose that she was making instrument sounds with her voice . . . she probably got hold of a bottle of champagne somewhere. Ain’t No Big Thing by Kui Lee had the “back row dancers” cutting up the rug. By Hob’s request, they sang another great song, written and sung by the Beamer Brothers back in the 1960’s called Sweet ‘Okole. Tani pointed out that ex-husbands give a lot of inspiration and she knows because she tried it twice, enough to make up her own new verse to the song which she sang with such sweetness. She even wrote a verse about Duane. When asked if she composes, her reply is, “No, I trash what everybody else wrote.” When I first heard about this trio, I read that they sang the song Sweet ‘Okole, and I mistakenly thought that was the name of their trio, so initially, I booked them for EKK under that name. But the sweetness of their harmony makes that name most appropriate for them. Darlene then introduced and sang Keyhole Hula or Kauoha Mai by one of her favorite composers, Lena Machado. The juicy story behind the hula is that Lena’s friend was invited to her gentleman friend’s home. She knocked on the door but no one answered so she peeked through the keyhole and what to her surprise, this is what she saw. Definitely, the swing beat is this group’s singing forte. Another thing they do really well is to modulate their verses from low to high, somewhat like climbing musical steps as they did with Kaulana O Hilo Hanakahi penned by Lena Machado. It’s a tour of Hilo’s landmarks –Wai’anuenue or Rainbow Falls, Kuhio Bay and Moku Ola or Coconut Island. Tani thinks it’s a song that was probably written for a lap steel guitar with the half step movements in the bridge of the song to feature a lap steel pa’ani. They followed with another traditional mele about King Kalakaua’s royal court dancer Emalia who met a young boy named Henry and sneaks away to meet him by the sandy shoreline of Hilo Bay. Hilo One (pronounced O-ne), another perfect song for the trio’s harmony, refers to this bayshore area. By this time the audience was so loud, so excited, so animated and caught up in the music. Hana hou requests were being shouted out by the audience, so it looked like this party might go on until morning. Aunty Bev’s very loud and commanding voice shouted ‘Akaka Falls so Darlene sang about this beautiful waterfall about 13 miles outside of Hilo near Honomu. Darlene’s grand aunt, Helen Parker Lindsay, wrote this song originally titled Wailele ‘O ‘Akaka about the star-crossed lovers who met at this private meeting spot. It’s quite appropriate that Darlene would have this as one of her signature songs. Her soaring voice and nuanced modulations made this song so memorable. Composed by Ellen Wright Prendergast after the illegal overthrow of Queen Lili’uokalani, Kaulana Na Pua is often called a protest song, but it’s actually a song that calls people to come together, work together and do what is right and just and pono. In the past it was also known as the stone-eating song referring to the fourth verse which speaks of the people that would rather eat stones than follow a new leadership. The audience stood and held hands as they joined in the song. A fast-paced song titled Heha Waipi’o by Sam Li’a about the Waipio Valley was harmonized brilliantly by the trio. Yes, we ran over time but the party goers did not stand up to catch any plane. Finally, everyone stood up, held hands, and called it an evening with Hawai’i Aloha. Yes! It is a Monday night, but we have been known to party early in the week and love it always.